Want to be notified of new releases in salviati/gomics? A gtk3 comic and image archive viewer written in Go, freely available under GPL v3+. Reads zip (and cbz) files directly, without writing to disk at all. 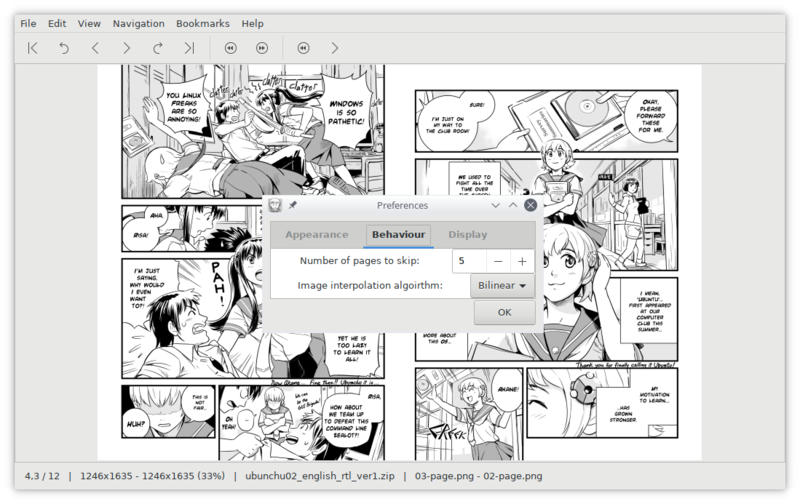 Comic and manga-mode (left-to-right and right-to-left page order). Basic scaling modes: original size, fit to height, fit to width, best fit. Image effects: horizontal flip, vertical flip. Can navigate between CG scenes (based on image similarity). gtk3, gdk-pixbuf2, glib2. For compiling from source, go and go-bindata are also required. Arch Linux users can alternatively install the AUR package gomics-git. Up/down or page up/down or right/left mouse button: previous/next page. Ctrl + up/down: previous/next archive. Left/right: skip backward/forward (# of pages is configurable). Ctrl + left/right: previous/next scene (useful for CG archives). Scroll image: mouse wheel or shift + direction keys.